If you need an Energy Certificate in Tenerife to put your property for sale or rent, you are in the right place! 1 – Get in touch with me to indicate the property for which you want the Energy Certificate and receive a quote. 2 – We will send the technician the agreed day to visit the property and make the necessary measurements to determine the energy efficiency. 3 – In a maximum of 48 hours you will receive the registered energy certificate and the energy label by email. It is valid for 10 years. 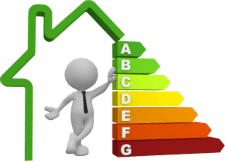 The certificate of energy efficiency is now mandatory to rent or sell any property in Tenerife. If you are selling an apartment or villa, you must show the efficiency label in all the advertisements you make and you will also be asked to bring the original certificate to the notary on the day of the sale. Contact me to get your energy certificate in Tenerife from € 70. Complete the following information and i will get in touch to send you the technician.